A guest post by Lisa Howard of UCDavis explains the efforts by the National Primate Research Centers to help rebuild Cayo Santiago, better known as ‘Monkey Island’ rebuild after Hurricane Maria. Primate researchers are rallying to help Puerto Rico’s “Monkey Island,” Cayo Santiago, which took a direct hit from Hurricane Maria in September. 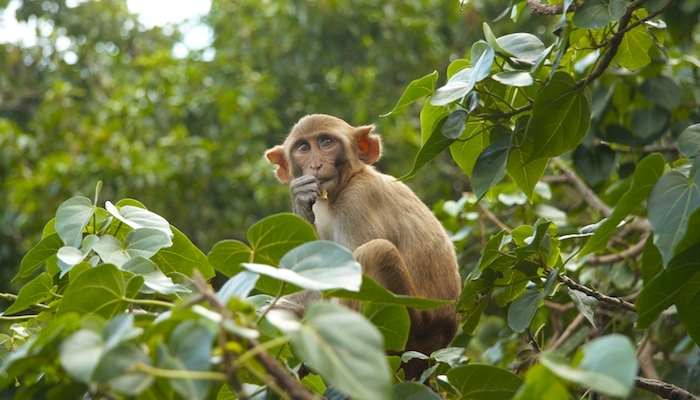 About a thousand rhesus macaques roam free on the 38-acre island, which is run by the Caribbean Primate Research Center and the University of Puerto Rico. Although all the animals apparently survived, the island’s infrastructure and equipment – piers, buildings, rainwater collection systems, even the cages where researchers could eat lunch without it being stolen by monkeys – was destroyed. On the main island of Puerto Rico, the town of Punto Santiago, where the research center’s headquarters is located and where many staff live, was devastated, losing water, electricity and communications. Each of the U.S. centers is contributing $5,000 to a fund to help Cayo Santiago. Darcy Hannibal, a project scientist at the CNPRC and colleagues worked to fill a shipping container with desperately needed supplies for both the field station’s staff and the research facility, including water, canned food, diapers, baby formula, tarps, water purification tablets and filters, chain saws and other equipment. The researchers also prepared an emergency National Science Foundation grant application for Cayo Santiago to replace equipment. Hannibal did her doctoral work at Cayo Santiago in 2004-5, observing feeding behavior in the monkeys. She and her colleagues at UC Davis hope they can get the word out about the importance of this unique research facility and get help for its people and animals. All of the macaques on the island are descended from 409 monkeys brought to the island in 1938. All the animals are identified and their pedigrees are known, making it an invaluable resource for scientists who study primates. Researchers from universities in the United States and Europe use the island for a wide variety of primate behavior studies. In addition to supplies, Hannibal and other supporters are trying to raise cash for the facility. Two GoFundMe pages have been created, one for the staff, Relief for Cayo Santiago Employees, and one for the animals, Cayo Santiago Monkeys: Maria Relief. There is also a Facebook page, Friends of Cayo Santiago, where people can get updates about the damage and recovery efforts. Hannibal can be reached directly at dlhannibal@ucdavis.edu. Posted on November 7, 2017 by EditorPosted in News, Science NewsTagged cayo santiago, CNPRC, monkey, monkey island, national primate research center. Next Next post: Research Roundup: Human brain organoids, universal flu vaccine and more!